Most of the time when you actually need a flashlight, the batteries are dead. VuPoint solves that problem, for good. 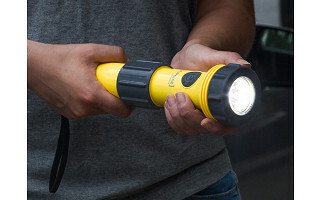 Their kinetic emergency flashlight is a heavy-duty, waterproof flashlight that is powered by you: simply twist the base of the flashlight and you’re charging it. It’s smooth and easy to twist, too—even a child could do it. This is unlike any other emergency flashlight you’ve seen. It’s a 3W LED, 200-lumen light with three brightness settings. There are flash and SOS functions for emergency situations, and if you get tired of twisting, you can also charge it with the included USB cable. Plus, the VuPoint includes several simple tools that are handy in an emergency, like a compass, mirror, can opener, and a whistle. It even floats. Keep one in your car, one in your emergency kit, and one in the cupboard where you used to keep the flashlights with dead batteries. You’ll always have light when you need it with VuPoint. Hello everyone! I'm proud to introduce the VuPoint flashlight to The Grommet. I'd be happy to answer any questions you have! What is the twist/light ratio? I.e. For 20 twists how long will the light stay on? How hard is this to twist? Could my 78 year old mother twist this? Once twisted, how long before the power goes out? @Carol The Smooth mechanism allow the twist to be effortless. The power turns on as quick as your first twist. Looks like a good thing to have on hand. How long does it keep a charge? I see you say 1 minute of twisting, provides 15 minutes of power, how long do you have to twist to fully charge it and how long would that charge last? @Roger as stated for every 1 minute of twist you get 15 minutes of power. To fully charge the flashlight 5 minutes of twist all that's needed. I am interested to know how you are storing the power? I work with a local CERT and would love to have a forever flashlight that takes a minute to charge. If you are using batteries, what's the shelf life? @Jeff let me get you the answer for you. I will reach out to our product specialist. Hi Hugo, is the flashlight itself heavy? I know that it can float on water but it seems rather chunky. Also is the material of quality? @Adam The flashlight is light in weight about 1.5 lbs comes with high quality SBS plastic which is durable. How easy would this be to use by an older person with arthritis in the hands and shoulders? It's expensive, and I would want to know that it could be charged easily. 20 twists every 15 minutes is a lot for someone with these issues. @Marcia Very easy, as the twist is effortless. If an older person is operating the flashlight they can twist at their own speed and stop when needed to eliminate any hand discomfort. And still get the same results. Hi Susan, VuPoint is made in China! Awesome job, will be getting this in the near future for my kit. I noticed in the video it floats lens up, great idea but the ring face maybe should be yellow as well to be seen in the water better if light is out. I love this one. Very nice item, and very handy to have anywhere in traveling in car, etc. It 'beats' the ones that need to be 'shaken' (not 'stirred') to get a few min. of minimum light. However, $69 is a lot for one flashlight. Even at today's prices, $69 (+S&H) could buy a lot of good batteries. Will the price be lower in time? Hi Myron, you are quite right in that is extremely handy especially compared to the James Bond flashlights you mention. The price is a reflection of not just the technology behind the flashlight that eliminates batteries from the equation forever, but also the other gadgets that come with it. VuPoint also comes with a knife, whistle, spare dust cover, can opener, compass, signal mirror, and USB cable. Also, a bottle opener to make celebrating the averting of an emergency that much easier! The brightness details are: 3W LED light capacity with brightness control, 200 lumens. the pic shows two usb plugs, one strait, the other coil. do you get both, or is this pic in error? seems like a great tool! @christopher comes with two USB, one to charge the flashlight the other to charge your accessories such as cellphone, tablets, ect..
@Hugo I just purchased one after reading this comment. Although after re-reading the description it does include "power bank", I didn't pick it up that this was able to charge my cell phone in an emergency. I was interested before, but this sealed the deal. I think that you should really highlight this function! @Bob Yes totally agree with you, as it's an excellent way to charge your mobile devices. Thanks for your purchase! "Highlight this function"...nice one, Bob! The key to this product is the "no batteries required" aspect, but yes, VuPoint has a powerbank, so if you have a USB charger you can plug it in. Hi Pat, there is an input near the top that looks like a headphone jack. You plug the USB adaptor (that you get with the flashlight) into that jack and connect your USB phone charger through the adaptor to charge your phone. @Steve Thanks for the complements! Always looking for media exposure. Hi Rob, thanks for the comment. We understand it may be out of the price range of some. It's the battery-less technology, LED lights, phone-charging and floating capabilities, and all of the extra emergency kit items (that are probably worth more than just a few dollars) that drives up the price. If you decide to make the purchase, you can rest easy knowing you will get your money's worth. @Mike We usually deal with local clients only, but I think your product is something special. The LED lighting is what really appeals to me. Seems like you've got "bright" with just a few turns. I'm ordering this afternoon for myself. Is there a way to reach you privately for a few marketing ideas? Thanks! My experience, and the experience of others, with a number of "kinetic" flashlights is that they stop working, especially when you need them most. I've even purchased such things that had hidden batteries (though I'm certain Grommet wouldn't sell such a thing). @Jim Hey Jim, Our kinetic flashlights are tested to operate on demand. We have a full 1 year manufacture warranty but if you experience any issue beyond that contact us direct for an exchange no questions asked. That is correct, Arthur, $70. 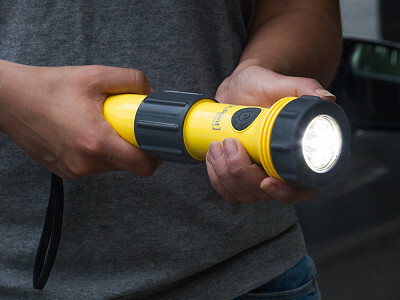 Not only for the flashlight, but for some useful emergency tools as well. And it can charge your phone! Now you don't need batteries. You just need a few twists of your wrist, which, given your physique, should be child's play! Most of the time when you actually need a flashlight, the batteries are dead. VuPoint solves that problem, for good. 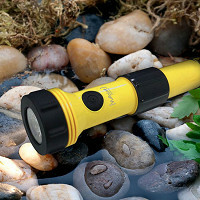 Their kinetic emergency flashlight is a heavy-duty, waterproof flashlight that is powered by you: simply twist the base of the flashlight and you’re charging it. It’s smooth and easy to twist, too—even a child could do it. This is unlike any other emergency flashlight you’ve seen. It’s a 3W LED, 200-lumen light with three brightness settings. There are flash and SOS functions for emergency situations, and if you get tired of twisting, you can also charge it with the included USB cable. Plus, the VuPoint includes several simple tools that are handy in an emergency, like a compass, mirror, can opener, and a whistle. It even floats.